Monsanto Calls Bayer's $62 Billion Takeover Offer 'Financially Inadequate' : The Two-Way But the St. Louis-based seed company makes clear it's still willing to negotiate with the German chemical and pharmaceutical giant. 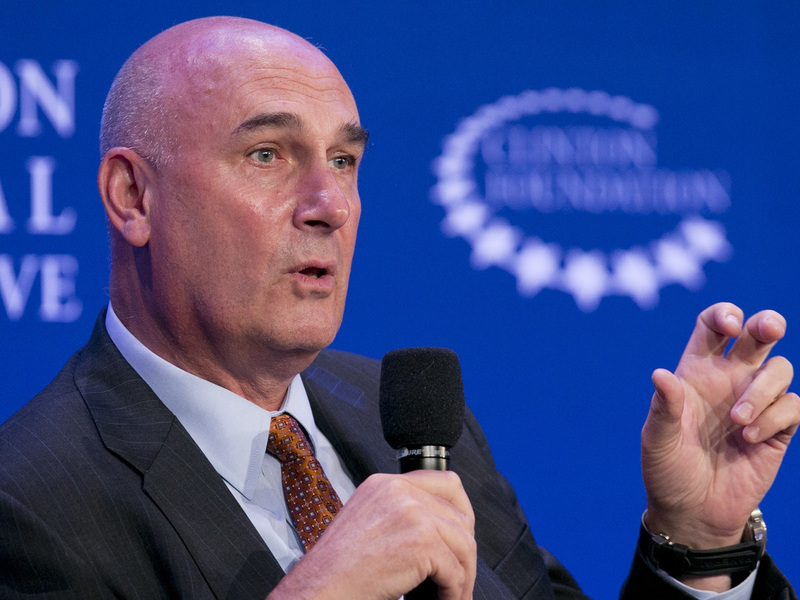 Monsanto chief executive Hugh Grant says he likes the idea of a merger — in theory. He's shown here at an appearance in New York last September. Monsanto has rejected a $62 billion takeover bid from Bayer as "incomplete and financially inadequate," but left the door open to further negotiations with the German chemical and pharmaceutical giant. "We believe in the substantial benefits an integrated strategy could provide to growers and broader society, and we have long respected Bayer's business," Monsanto Chairman and CEO Hugh Grant said in a statement. "However, the current proposal significantly undervalues our company and also does not adequately address or provide reassurance for some of the potential financing and regulatory execution risks related to the acquisition." The statement appears to signal that St. Louis-based Monsanto is open to further talks with Bayer but, as was widely expected, wants more money and better terms before it accepts a deal. The seed company also left the ball in Bayer's court, saying it wouldn't make any further statements. In the meantime, it said, no guarantee exists that a deal will be reached. Monsanto's decision to hold out for more money means Bayer will be forced to sweeten its terms, which likely won't sit well with investors. Many are already said to be worried about the impact of a deal on Bayer's bottom line, and shares of the company fell Monday after details of the offer were announced. A merger between the companies would create the world's largest supplier of seeds and agricultural chemicals. Monsanto is also a leader in the field of genetically modified seeds. "Despite its preeminence in seeds, Monsanto has become vulnerable to a takeover as a number of problems piled up this year. The company has cut its earnings forecast, clashed with some of the world's largest commodity-trading companies and become locked in disputes with the governments of Argentina and India." Bayer had no immediate comment about Monsanto's rejection of the bid.